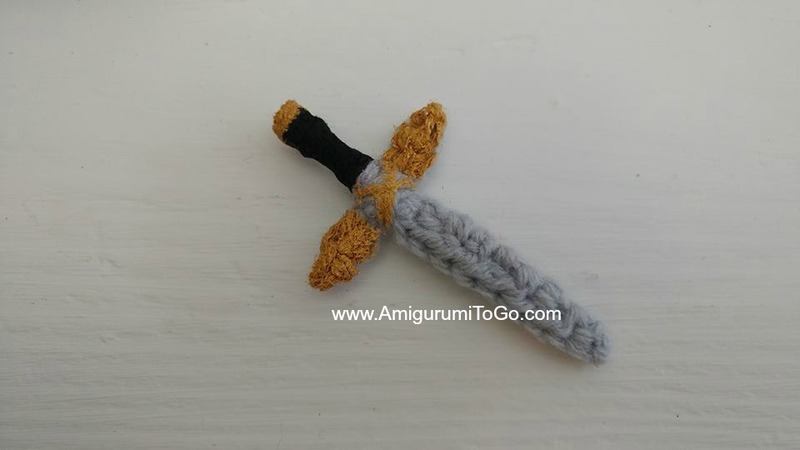 This sword was designed specifically for the Little Boy Knight, (also a free pattern here), but you can use this sword for any pattern or by itself. instructed then you should get a sword about 3 and 3/4 inches long. 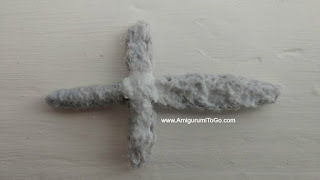 About the glue: I found Alene's tacky glue worked best for stiffness. Elmer's school glue worked too but not as stiff as the tacky glue. f/o leaving a long tail. 1-2) Using the finishing yarn tail of the sword blade, weave it in and out to the tip of the blade then back again to where you started. This adds more strength to the blade without adding bulk. This will also fill in any crochet holes if you crocheted a bit on the loose side. Use short, tight stitches and keep them neat looking. Be sure to stretch the blade out when you are done weaving. 3) Make the handle end of the blade thicker by wrapping the finishing yarn tail around the end. Take note of where the handle end stops, that's about 4 stitches down. 4) Lay the starting yarn tail down the center and wrap around it. Squeeze the handle end together and, using the finishing yarn tail, wrap tightly and evenly to the stop point. Knot the finishing yarn tail to hold it there. Cut the starting yarn tail free. 5) Bring the finishing yarn tail through the handle, come out anywhere then cut free. 6) Prepare the handle before for attaching to the sword. Using the starting yarn tail, weave in and out to the other end then weave back to the center. This is for the same purpose as the blade, strength without adding bulk. Knot off then weave the yarn tail close by the knot and cut it free. Now weave the finishing yarn tail to the center. 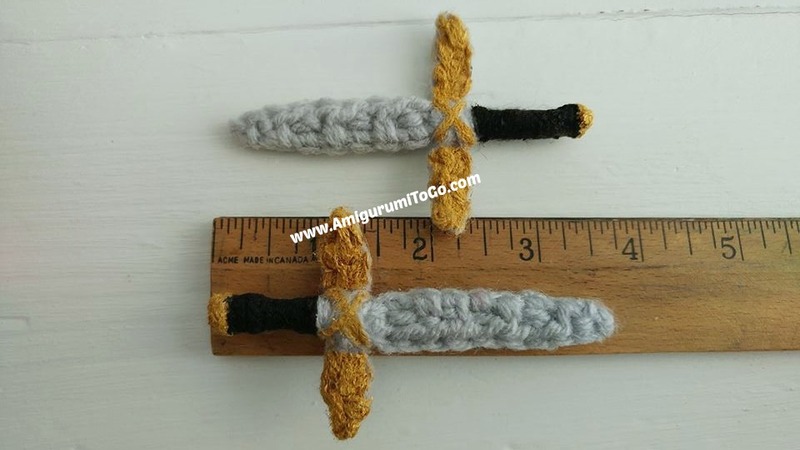 You will use the finishing yarn tail to sew it to the sword. 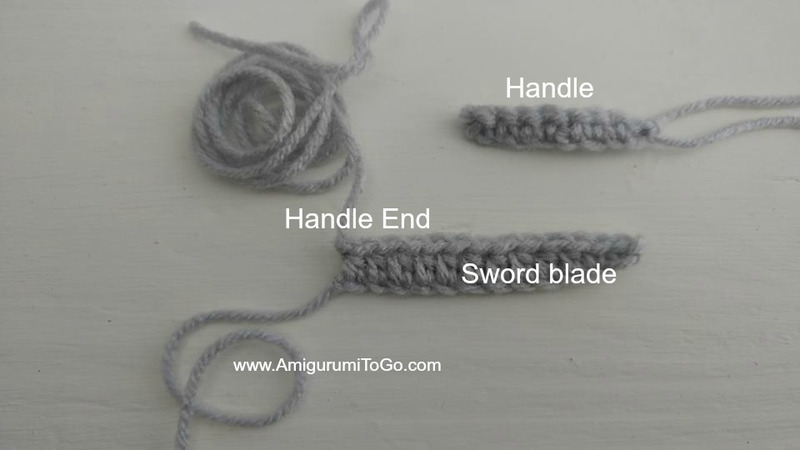 7) Place the sword over the handle as pictured, bring the finishing yarn tail through the sword and pull tight then wrap crisscross a few times to secure the handle to the sword. Knot off, weave in the finishing yarn tail and cut free. You can leave the sword as is or take it a couple steps further by adding glue to stiffen the blade and you can paint to decorate. 1) First stiffen the blade. Add a generous amount of clear drying glue to the back side only of the sword and leave it to dry before painting. I used Elmer's for one sword but I found tacky glue was much better for stiffness. If all you have is Elmer's, don't worry, it still works. 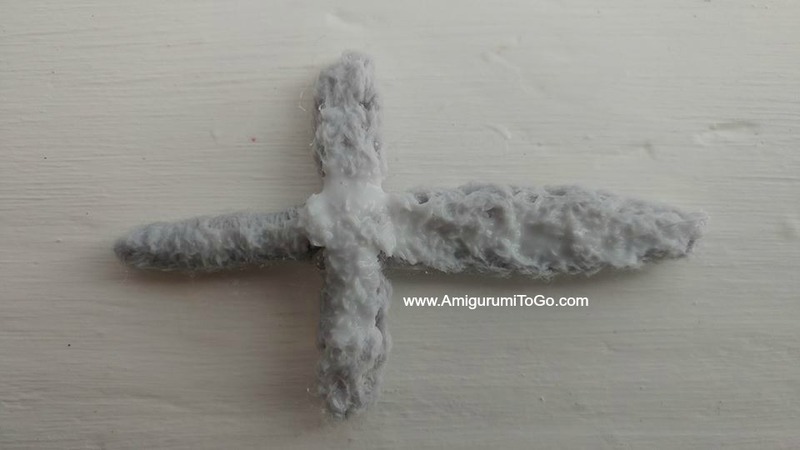 2) Spread the glue out with your finger. Make sure the sword and the handle are straight. Get glue all around the tip of the handle, smoothing out any stray strands of fiber. Also squeeze any parts that look bumpy on the sides of the blade and handle, smoothing any bumps before leaving to dry. I set my sword under a fan and it was dry enough to paint in about 20 minutes. If you let it air dry it will take a couple hours. CREDIT: I have to give credit to my good friend Kim Sofia of Kim's Sticks and Strings for this stiffening technique. She takes yarny doll custom orders as a side job. I ordered a skeleton from her a couple years ago, the bones were stiff and she gave me her secret on how she did it! When I asked her if I could use the same technique in this pattern she said sure and that she learned it from her grandmother, Ruthie, who used to stiffen doilies this way. So a big thanks to Kim and her wonderful grandmum for this idea! It's super easy and it works great. 3) Paint the handle. I used gold metallic and also black. Feel free to get creative and decorate as you wish! 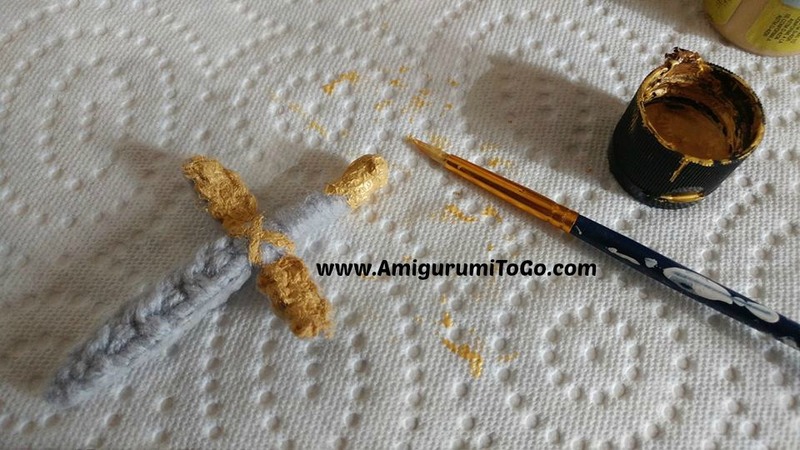 I painted the gold parts first, left it to dry, then added the black paint. Once the paint is dry, add a bobby pin to the backside of the sword as pictured. Poke the other end of the bobby pin into the Knight and he's now ready for battle! I hope you enjoyed this pattern! I'd love to see it, post pictures on my facebook page, also tag me on instagram.